So, that brings us to Surviving the Winter #1: The Golf Club. 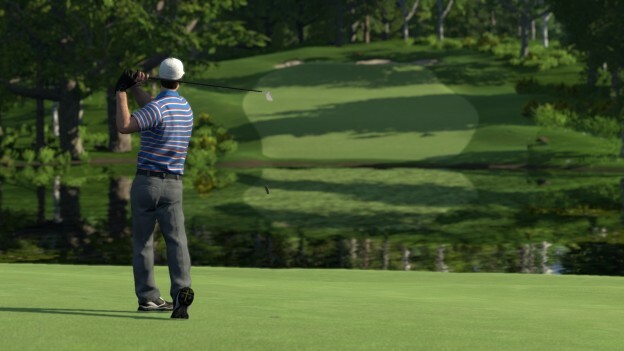 The Golf Club is a PC-based golf simulator. It would be tempting to categorize it as a "video game," but I make a distinction between video games a simulators. A golf video game, for example, would have you play in the persona of an actual golfer like Tiger Woods. It would have all of the trappings of being on the PGA tour. It may even have pretty reasonable simulator-like behaviors with regards to ball physics, or it may not. The line can be pretty blurry between the two, but a true simulator strives for as much reality as can be made to work within the confines of a computer, often at the cost of ease-of-play. The beauty of a golf simulator to me is that it lets me approach the game in the way a good golfer would, which is to say taking into consideration all of the aspects like the wind, layout of any given hole, etc. As probably the only person to ever receive a cease & desist order from the USGA demanding that I stop ruining their game (no, not really! ), this is very attractive to me. Anyway, most of what I will be including in this series, at least with regards to the virtual PC-based world, will be simulators. Aerodynamic drag refers to the forces acting opposite to the relative motion of any object moving through the air. A spinning object traveling through the air will generate lift. Put backspin on an object and the Magnus effect will produce an upward force. Topspin, a downward force. So, controlling spin means controlling, not just what happens after the ball bounces, but what happens over the entire course of flight. This is why the Magnus effect is so important in any golf simulation attempting realistic ball flight. Our wind simulation follows the Beaufort scale, a measure that relates wind speed to observed conditions. We have modeled them all. Each level has different behaviour. If you watch the wind arrow in the HUD, the trees and the flags will behave much like the windsock and trees in this video. The initial trajectory of the ball is largely determined by the parameters of the impact between the club face and the ball. There is no “apply backspin” button in our simulation. Launch angle and back spin in our simulation is determined by attack angle, the “dynamic” or “delivered” loft of the club at impact, as well as the club head speed. The delivered loft, as opposed to the static loft stamped on the club (i.e 48 degrees on a PW), is determined by a number of factors in real life. In our game it is determined by our Attack Angle / Stance Hybrid Control. The fact is, the ball does not know you are hitting it with a 7 iron, what your wrist position is, that you swing like Charles Barkley or that you aren’t wearing any pants. It doesn’t care. If you take a 7 iron and hit a golf ball with the delivered loft and club head speed of a 9 iron, it will fly like it was hit by a 9 iron. There are no shortage of golf courses available - there are literally thousands of them - due to the built-in golf course editor that allows people to build and share their own. What you won't see is licensed real-world courses like St. Andrews or Pebble Beach. This may be one of the reasons this simulator costs only $30. Although, I recently bought a $10 enhancement that adds handicapping, a new golf course environment, and some more ways to play in a faux tournament. Even so, $40 is a very fair price, and you can get it for even less if you wait for it to go on sale on Steam*. As with many of the Surviving the Winter tips I will be providing, the cost is usually not going to be limited to the items presented. In the case of PC-based sims, you will also need a relatively robust computer to run them on. Some of them will also have Xbox One or Playstation 4 equivalents, so you can just boot the kids off of the console, or you could look into buying something new called a Steam Machine. If you have a fairly new PC (mine is five years old), you can probably get by with a newer 3D graphics board. I recently upgraded mine to an nVidia GTX970, but be careful to ensure that your PC has the correct card slot and a strong enough power supply to support it.